Hey gang, GATE CRASHERS comes out next June, but preorders are already up and running at Amazon. If you didn’t know, preorder numbers are an important metric for any book launch, as it helps the publisher gauge interest and make decisions on things like how much promotional budget to give it, how big an initial print run, etc. So, no pressure, but if you’re at all interested in buying a book, preordering it is one of the more helpful things you can do for the author. That said, you can preorder GATE CRASHERS here. And you Goodreaders, it’s also up and ready to be put on your “want to read” shelf to give you a reminder as we get closer to June. Goodreads also has a nice little plot summary. Check it out. That’s all for right now. I’ve got some other great news still in the hopper waiting for permission to share. Keep an eye out for updates. If you’ve hung around me at all for the last six or seven years, you’ve heard me bang on about the first book I ever wrote. Back then, it was called A HOLE IN THE FENCE. It was a plucky little space opera/slapstick comedy that sat on the bench while the Children of a Dead Earth books made the varsity team. Six rewrites and a signed contract with Tor Books later, it goes by a new name. 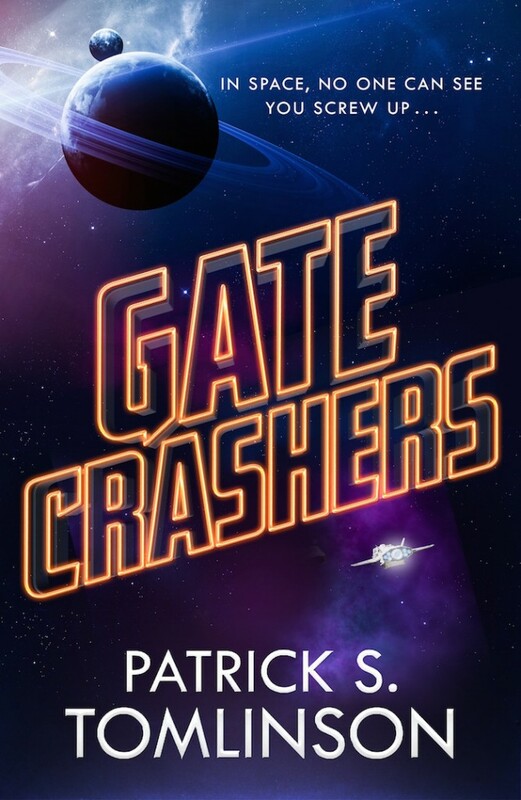 GATE CRASHERS comes out on June 18th, and I can finally reveal its amazing cover art.